VST / AU Dub Machines are finally here ! 18 May VST / AU Dub Machines are finally here ! SURREAL MACHINES are proud to announce the immediate availability of our debut VST / AU Plugins: MODNETIC & DIFFUSE, together forming the DUB MACHINES Package. BUY or DEMO MODNETIC here. DOWNLOAD DIFFUSE for FREE (until June 8th) here. DUB MACHINES is a bundle of two analog inspired Delay / Reverb / Modulation Plugins in VST (2 & 3) & AU formats across 32 and 64 bit operation for WINDOWS and OS X hosts. The new Plugins have a rich history, being developments of the most successful and sought after Max For Live devices in the Ableton store over the last few years. MODNETIC is a reimagining of the old Magnetic device, re-coded from the ground up with new features and better CPU management. New features include a brand new Bucket Brigade modelled Modulation section offering silky sweet to broken Choruses, Flangers and Phasers, 35 new Impulse Responses and endless, glitch-free routing capabilities all within the characterful and warm Tape Delay emulation system you know and love. DIFFUSE is a reworking and port of the old Diffuse device via Cycling ’74’s Gen / Code Export system. 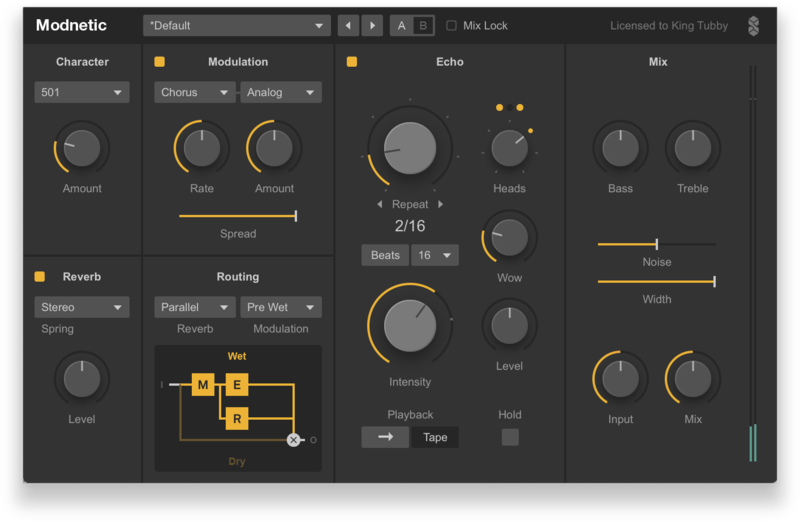 DIFFUSE allows for morphing between Delays and algorithmic Reverbs with warm analog modelled saturation and surgical control via an intuitive and clean interface.